Famous for its annual motorcycle gathering, Sturgis, South Dakota is located in the Northern Black Hills region, home to memorials and museums, Bear Butte State Park, Fort Meade, and scenic byways. 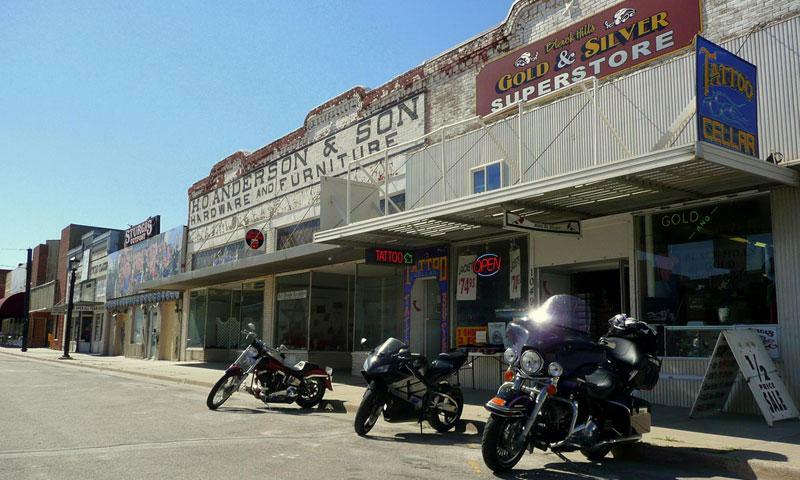 Named after Major Samuel D. Sturgis, one-time commander of Fort Meade, Sturgis, SD is a town of 7,000 residents that plays host to a half million people every August during its annual motorcycle gathering. While best known for its rally, a range of other attractions and activities are located in and around Sturgis. Bear Butte State Park, Fort Meade Cavalry Museum, Vanocker Canyon and Boulder Canyon scenic byways, a public golf course and more is located here, offering fun for the entire family. Sturgis is located in the northern Black Hills area, just off Interstate 90, exits 30 and 32. Accommodations – Major hotel chains, local motels, and surrounding campgrounds and RV parks. Food – Fine dining, saloons, lounges, family restaurants, pizzerias, and chains. Shopping – Recreational and motorcycle equipment, souvenirs, boutiques, jewelers, art galleries, groceries. Hiking: Try part of the Centennial Trail in Forte Meade Recreation Area (Fort Meade Trailhead) or choose a trail in Bear Butte State Park. Golfing: Spend a few hours on Boulder Canyon Country Club’s 9-hole course. Art Appreciation: Drop into one of the art galleries, view the public sculptures, or explore the Sculpture Walk. Sturgis Motorcycle Rally: The gathering runs for one week in August. Thousands of people from all over the country travel to this event to experience the races, rallies, music, and merchandise and food provided by 800 vendors. Don’t forget to stop into the Sturgis Motorcycle Museum and Hall of Fame. Bear Butte State Park: Hike the trails; summit Mato Paha or “Bear Mountain,” the unique butte formation sacred to many Native Americans; camp around the lake or launch your boat at the ramp; and be sure to check out the visitor center and interpretive displays. Vanocker Canyon and Boulder Canyon: Whether you're in town for the rally or taking your family on a tour, be sure to drive one or both of these scenic byways. Fort Meade: Visit the museum or tour the old buildings and parade grounds. From Mt. Rushmore (Keystone, SD) - Sturgis is approximately 52 miles (1 hour drive) from Mt. Rushmore. Travel northeast for 1.7 miles on SD-244 before turning slightly left onto US-16A. Follow for 3.4 miles. Merge onto US-16 east toward Rapid City for 18.2 miles. From Rapid City, travel towards Gillette on I-90 west/US-14 west/SD-79 north for roughly 25 miles. Take exit 30 or 32 for Sturgis. From Spearfish, SD - Sturgis is approximately 21 miles (20 minutes) from Spearfish, SD. Take I-90 east/US-14 east for 17.6 miles. Take the I-90-BL/US-14A west exit (30) towards Deadwood-Lead for .2 miles. Contine to follow I-90 BL/SD-34 for 2 miles. Official site for Meade County of South Dakota. Official site for the City of Sturgis, South Dakota.